When Canadians think of young, emerging talent in the men’s soccer game, they invariably drift over to Germany, where 18-year-old phenom Alphonso Davies is already making his presence felt at Bayern Munich. However, as Canada prepares to face French Guiana at BC Place in the final CONCACAF Nations League qualifying match, there is another teenager currently playing in Europe fans should be keeping an eye on. Jonathan David, a 19-year-old forward from Ottawa, is filling the net for KAA Gent in the Belgian First Division and is the player to watch, according to Canadian teammate Jonathan Osorio. David has shown a flair for instant impact, coming on as a substitute in his senior debut with Gent in August of 2018 and scoring a 90th-minute equalizer against Zulte Waregem. He then went on to show that his first marker was no fluke, coming off the bench to score four times in his next three games, including a brace against Waasland-Beveren. In total, he needed only 65 minutes of game time to produce his first five markers. 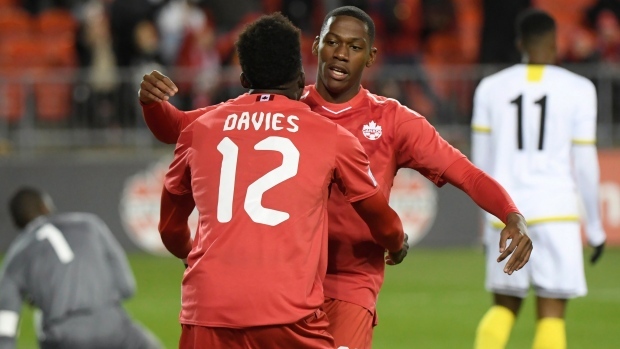 David made his international debut for Canada in a Nations League qualifying game against U.S. Virgin Islands with one goal on his mind. He waited an entire 32 minutes before getting started on that promise, becoming the youngest player ever to score for the country on his debut. Five minutes later, he became the fifth player to find the net twice in his first outing for Canada. 32' GOOOOAL! Jonathan David scores in his international debut!! David has since added a goal and two assists in three appearances for Canada as he continues to make his name on the international stage. The Ottawa native has also continued his good form in Belgium, netting eight goals and four assists in 23 league games, along with his two goals in four Europa League qualifying matches. On both the club and international stages, the 19-year-old has already proven to be one to watch in a career that is just getting started.